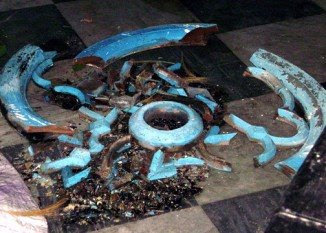 The colorful blue glass window of Yangon's Musmeah Yeshua Synagogue fell to the floor during the cyclone that ravaged Myanmar on May 3, 2008. NEW YORK (JTA) -- The Starbucks on 50th Street and Second Avenue in Manhattan is a world away from the gruesome mayhem that is the aftermath of the cyclone that hit Myanmar last week. But as Sammy Samuels sips on a $4 coffee, his thoughts are with his home and family in the ravaged country's capital. His is one of only eight Jewish families in Yangon. Samuels is heading there this week to deliver suitcases of water purification tablets and medicine. When he arrives, the fourth-generation Burmese will become one of the few Westerners to bring aid into Myanmar, where an estimated 1.5 million people have been severely affected by the cyclone that ripped through the country May 3. Cyclone Nargis killed anywhere between 30,000, the number given by the country's military rulers, and 100,000, the estimate provided by human rights groups. Yet even as worldwide pressure is mounting on Yangon to admit aid from Western countries, and even as Thailand is becoming a staging ground for what could be the largest U.S. aid effort since the 2004 tsunami in Southeast Asia, the military junta has refused entry to aid workers from the West. Only Westerners with Burmese citizenship are allowed in. Aid groups, including a number of Jewish groups trying to mobilize, are waiting to help but are handcuffed. Along with the water purification tablets, Samuels will bring cash to buy a generator for Yangon's only synagogue and hopefully to help repair the 110-year-old temple, whose roof and windows were destroyed during the cyclone. "I'm just tired of being worried away from home," Samuels, 27, told JTA in an interview Monday at Starbucks. "I just can't stay here while people are having a difficult time, having gone through these difficulties. I just can't stay here." The Samuels family stayed and watched as the community dwindled to about 20. Four are his family -- his father, Moses; his mother, Nelly; and his two sisters, Kazna, 29, and Dina, 31. The beautiful brick synagogue features a two-tiered sanctuary -- the men sit downstairs and the women in the balcony -- but few in the community attend services. Samuels recalls that as children, he and his sisters on sunny days would sit in the sanctuary and watch as a prism of light through the stained-glass windows fell over the area in front of the Torah ark. Those windows were destroyed last week. Samuels moved to the United States in 2002 to attend Yeshiva University, from where he graduated in 2006 with a degree in international business. He also came to find a Jewish bride. In Myanmar, with only 15 Jews who are not family, that's a difficult proposition. He called home but couldn't get through. "People died. My family, I tried to call them every 15 minutes -- for three days I had no contact with them," Samuels said. "I was so worried and terrified. I had no idea what was happening." "My father said in all his life, in 60 years he had never seen anything like that," said Samuels, slight of frame, bespectacled and Asian in appearance. "Both of my sisters, they were shaking and praying. All the winds and rain and sounds were just terrifying." He recalls his father saying, " 'Even though we are here suffering like this, you cannot imagine how the small villages and the small towns and all of these small houses, what these families went though that night. You cannot imagine.' "
Despite his father's protestations, Samuels decided he would go to Burma. "Though they wouldn't say so, I know they wanted to see me," he says of his family. His two-week trip is turning into a relief mission through the help of Scott Klepper, a business consultant in Utah. Klepper, 47, met Moses Samuels on a trip to Burma in March. Upon hearing about the cyclone Klepper, an avid outdoorsman, remembered the water purification tablets he uses when hiking. He pulled out one, looked at the packaging and found the manufacturer, Wisconsin Pharmaceutical. Samuels called the company's president, who offered to sell him the pills at cost and make a donation of 20 percent of the total sale to help Myanmar. Working with the American Jewish Joint Distribution Committee and through a self-propelled e-mail blast, Klepper by Tuesday had raised about $1,000 for the pills. Klepper said he was hoping that by the time he sent the water purification pills by overnight mail to Samuels on Wednesday, he would have been able to buy enough to make up to 2,500 gallons of water usable. Monday night, the Hillel at New York University and two partners held a fund-raiser at a downtown art gallery to help raise money for the Burmese Jewish community. Samuels said the water purification tablets will go to help the general community, not just Jews. He also hopes the synagogue can be repaired quickly so it can take in those left homeless -- Jews and non-Jews. Samuels' mission is only part of what is a mounting Jewish response to the cyclone. The JDC has three staff members in some of the hardest hit areas of Myanmar. They entered the country on Israeli passports via Israel and through Thailand. Myanmar has good diplomatic relations with Israel, unlike its paranoid attitude toward the American government. During the Indian Ocean tsunami four years ago, the system raised some $18 million for relief to help build infrastructure, schools, community centers and low-income housing, the JDC's executive director, Steve Schwager, told JTA. The American Jewish World Service by Tuesday had raised some $60,000 to funnel to the 19 grass-roots organizations it works with on the Thai-Burmese border. And B'nai B'rith International announced last week that it would allocate $10,000 to help the Israeli organization IsraAid send 10 relief workers, including paramedics, doctors, nurses and water specialists, to Myanmar. A team of Israeli volunteer doctors, nurses and water specialists from two Israeli nongovernmental organizations under the umbrella of The Israel Forum for International Humanitarian Aid also arrived in the area May 8. It is expected to stay three weeks. But money has been slow to come in from the United States, according to Schwager. When he spoke with JTA on May 8, a day after the JDC opened its mailbox, the organization had received about $50,000. On Tuesday, according to another senior staff member at JDC, the number still had yet to reach $100,000, though it expects the federation system appeal to slowly start funneling more money into the relief effort, Schwager said. That staff member said JDC purchased a ton of bananas, rice and bottled water to ship into the region, and it was working with the Israeli Red Cross, Magen David Adom, in getting medical workers into the region. It was also searching for Burmese organizations with whom JDC could partner. The junta is warier of foreign press than of aid workers, and it is hard to appeal for aid when it's so difficult to describe the situation on the ground to donors. "The issue is that pictures are missing from the press," Schwager said. "It is purely all about the pictures. "During the tsunami, it was about dead bodies in the streets and corpses not yet picked up. The folks in Myanmar are busy expelling reporters." Just as it did in the aftermath of the tsunami, JDC is organizing a coalition of Jewish groups to mobilize a collaborative relief response. But while 40 to 70 organizations worked together in the aftermath of the tsunami, Schwager said only 10 participated in a conference call Monday. U.S. relief organizations are livid but not surprised by the junta's actions. "The military regime is infamous for being extremely closed to international organizations and having very strict restrictions," said an AJWS spokesperson, who asked not to be identified. "They are one of the most egregious human rights violators in the world. It is a very difficult place to work for international groups. "The situation now in Yangon illustrates that the military government has no responsibility towards its citizens." That relief worker is applying for a visa into Myanmar and is afraid of being identified because the government, which scours the Internet for negative news reports, would likely deny the visa for speaking out against it. Similarly, Sammy Samuels won't say much on the record about his mission, about the things he has seen in Myanmar in the past, and about his feelings about the situation there now. "It is not their fault. They should make a positive thing now and join with all the relief workers to let them in," he said of the government. "The natural disaster is not their fault, but their action now, that is their fault." "Yeah," he says, but then tempers his response. "Not only me, but all the international people." But his eyes belie his lips, framed by the sparse beginnings of a Vandyke beard. They grow cold and angry when he says that he understands the government's position on not allowing in aid to help the 1.5 million citizens it claims to protect. He understands that the junta is afraid of Western influence from aid workers inciting a coup. Those eyes warn that one should not misread his understanding as sympathy. And they grow a little nervous when he is asked to consider if something should go wrong, if authorities grow fickle and arrest him for bringing in aid from a Western country -- albeit just a suitcase or two of tablets and medicine. "I hope they have sympathy," he said. "It is part of he Burmese culture. But whatever happens, I have to go."